Marco Chung-Shu Lam, Licensed Acupuncturist in Boulder, COMarco Chung-Shu Lam, Licensed Boulder Acupuncturist, draws from his Chinese heritage an affinity for both traditional Chinese medicine and the Taoist world view. The ancient sages believed that health and peace came from being in harmony with the deeper currents of nature. 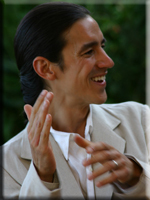 For more information about Marco’s medical practice, please visit his Boulder Acupuncture website.